It is a clear fact that SEO is an ever-changing phenomenon and every year has a mark of different faces of SEO. And, in between there have been several modifications made in the search engine algorithms towards making huge improvements to increase the user-friendliness. The ways that individual searches are being altered and now it is the semantic search that replaced the very old keyword based search. As days pass, search engine has become more intelligent and turns out to be the mastermind that offers visitors with more relevant data depending on the user’s location, timing, interests and search queries. It is essential to understand the fact that keywords are no longer going to bring up your search engine optimization a great success. So for this, you will have to spend only very little amount of time on focusing keywords while spending larger amount of time in quality content, discovering interesting and useful information and spreading it worldwide to gain popularity will be more essential. In today’s digital world, mobile search plays a vital role in attaining maximum traffic. Its importance is also mentioned in the latest Google Hummingbird Algorithm. As it is the essential factor, keep your eyes concentrated on it. This is the algorithm that gives benefit to mobile users and gives more user-friendly features one of which is the voice search. Mainly the algorithm was invented due to the raise of mobile internet users who require emphasis on the usage of mobile websites and have easy surfing. As you know, pay per click is one of the top most search engine marketing methods that help in increasing the search traffic and ranking of a website in an easy and instant way. It is also the top way of growing the business and selling their products and service more effectively to the clients. There are many programs like Google AdWords that are provides simple choices and options with different pricing for each keywords based on competition. As this is an ethical way to raise traffic and business, people have started to focus on it. In recent times, for getting a higher ranking, it is becoming essential to set up Google authorship profile for your blog posting purposes. The reason why it is vital is that it displays the profile as the authoritative one to the outside world making it as a proprietor of content marketing of the websites. Client testimonial has a great effect on enhancing the website’s visibility and reputation is the search engines. Asking clients to provide reviews on local listing, or give testimonials about the brand to showcase to the outside world. Basically it looks like crazy thing to ask for reviews, but these are the greatest tools that make wonders to the business websites. As these testimonials written by previous clients will talk about the quality of service or product, it will greatly help in satisfying the visitors and future clients to make a good deal with those businesses. 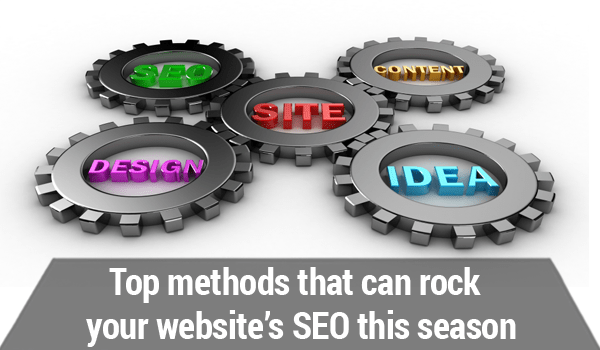 Hope you will like this simple yet effective tips in making your SEO campaign a great success! Author Bio: Amy Jasmine is an internet addict who loves to research about the web fundamentals. Currently, she is working on projects for a renowned SEO company in Los Angeles. Her passion is to become a leading digital marketer.